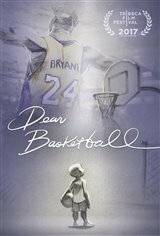 In this animated short film, NBA superstar Kobe Bryant reads a letter he wrote describing his love for the sport of basketball, beginning when he was a six-year-old boy who rolled up his father's tube socks to form a ball that he could use to shoot through hoops, while dreaming of becoming a professional player. The emotional letter takes us through his career, as he played for the sheer joy of it, to the time he realized he'd given all he could to the sport. The movie won Best Animated Short Film at the 2018 Academy Awards.